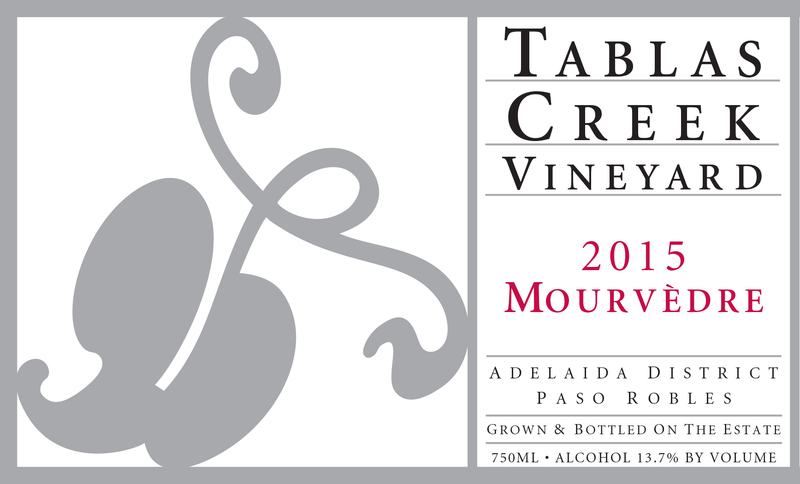 The 2015 Tablas Creek Vineyard Mourvèdre is Tablas Creek’s twelvth varietal bottling of Mourvèdre, from the exceptionally low-yielding 2015 vintage. We use most of our Mourvèdre in our Esprit de Tablas each year. However, we feel that the Mourvèdre grape, often pigeonholed as a blending varietal, can produce remarkable varietal wines, and when we have particularly characteristic lots of Mourvèdre, we try to reserve a limited quantity for a single-varietal bottling. The 2015 Mourvèdre has lifted aromas of sweet spice, raspberry, powdered sugar, plum, and mint. The palate shows deeper flavors of red cherry compote and new leather, with plum skin tannins and more of the sweet spice coming out on the finish. It’s delicious now, but we expect it to become more profound with age, as its flavors deepen, the tannins soften, and the meatiness that's lurking behind the fruit comes to the fore. Our Mourvèdre grapes were grown on our 120-acre certified organic estate vineyard. The 2015 vintage saw dramatically reduced yields from the combined effects of four years of drought and cool, unsettled weather during May's flowering. Months alternated between significantly cooler than normal and significantly warmer than normal, which produced an early start to harvest but required multiple passes through most vineyard blocks during a long, drawn-out picking season. Yields were down as much as 50% in early-ripening grapes like Viognier and Syrah, but later grapes like Mourvedre and Roussanne were only down slightly. The result was a vintage with excellent concentration but unusually good acids, and wines with dramatic perfume, texture, and intensity. Our Mourvèdre was harvested between September 23rd and October 15th. The Mourvèdre grapes were destemmed and then fermented using native yeasts in a balance of small open-top and enclosed stainless steel tanks. After three weeks, they were pressed and moved to 1200-gallon foudres to complete their fermentation. The Mourvèdre lots were blended in May of 2016, aged for an additional year in neutral barrels and bottled in April 2017.